Predicine and Flagship Biosciences said today they will partner to provide complimentary and comprehensive biomarker profiling for immuno-oncology clinical trials, through a collaboration whose value was not disclosed. The collaboration will combine Predicine’s GeneRADAR molecular insights platform with Flagship’s artificial intelligence-enabled computational tissue analysis (cTA) digital pathology platform, with the goal of offering an integrated molecular and contextual tissue biomarker solution for their pharmaceutical customers. GeneRADAR is a combination circulating tumor DNA (ctDNA) plus circulating tumor RNA (ctRNA) non-invasive liquid biopsy test, designed to provide a more comprehensive understanding of molecular alterations in cancer. According to the company, GeneRADAR is the first such test designed to provide a comprehensive understanding of molecular changes in cancer. Predicine technologies also include a biomarker database designed to identify the molecular alterations in a patient's cancer, then match the patient with relevant targeted therapies, immunotherapies, and clinical trials. At the American Association for Cancer Research (AACR) 2018 Annual Meeting, held April 14-18 in Chicago, Predicine presented posters that included one detailing the detection and validation of cancer immunotherapy biomarkers. 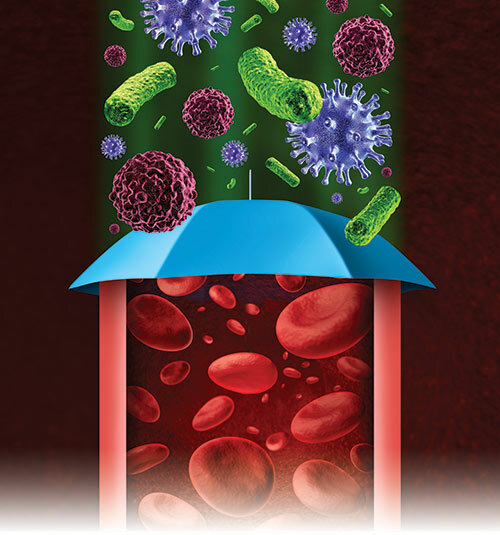 The company used GeneRADAR to develop a blood-based PrediSeq NGS panel designed to capture genomic alterations in 180 cancer genes including tumor mutation burden and microsatellite instability, as well as a Predi-CI (Cancer Immunotherapy) panel designed to measure dynamic expression change of 212 genes related to immune cells or immune responses. Flagship’s cTA pathology analytics platform is intended to deliver comprehensive tissue profiling for predictive diagnostics in drug therapy. Flagship works biopharmas worldwide to craft biomarker strategies used in the development of companion diagnostics in immuno-oncology as well as fibrosis, and rare neuromuscular diseases. Predicine and Flagship reason that using multiple diagnostic approaches offers greater opportunities for understanding patient-specific response to immuno-oncology therapies. “We believe this alliance will greatly benefit our biopharma clients and is a further step in Predicine's goal to provide a comprehensive blood- and tissue-based biomarker profiling in support of global clinical trials, especially in the immuno-oncology space,” Predicine Founder and CEO Shidong Jia, M.D., Ph.D., said in a statement. The partnership with Predicine also marks an expansion of Flagship’s global footprint, since the companies plan to use Predicine’s CAP-accredited precision cancer testing laboratories in China; Predicine maintains biomarker service facilities in Shanghai and Harbin, as well as in the U.S.
“The combination of molecular and contextual tissue biomarkers represented by this venture between Flagship and Predicine will help patients everywhere by further empowering personalized medicine for global clinical trials in immuno-oncology” added Flagship CEO Trevor D. Johnson.